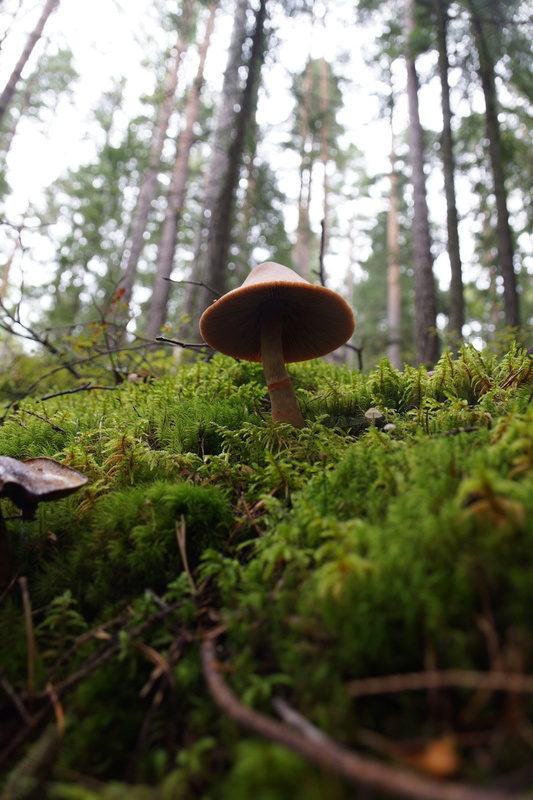 For my birthday I decided I wanted to go mushroom hunting in Finland. 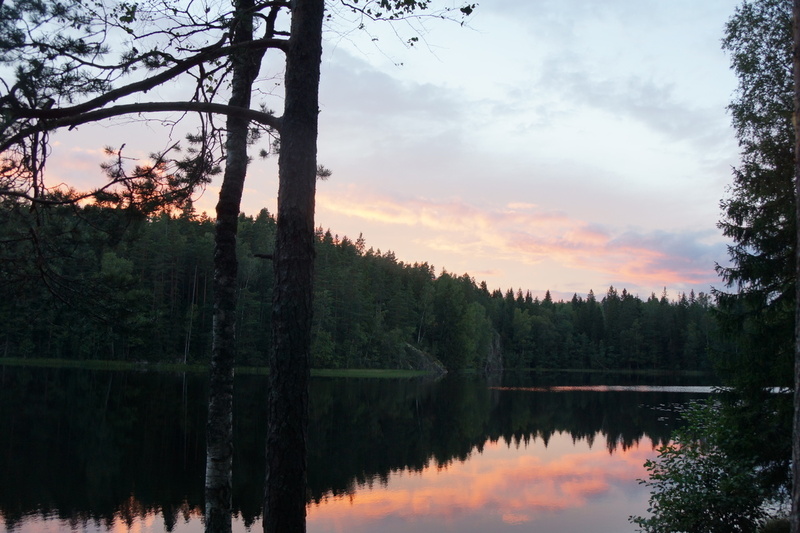 Why Finland? 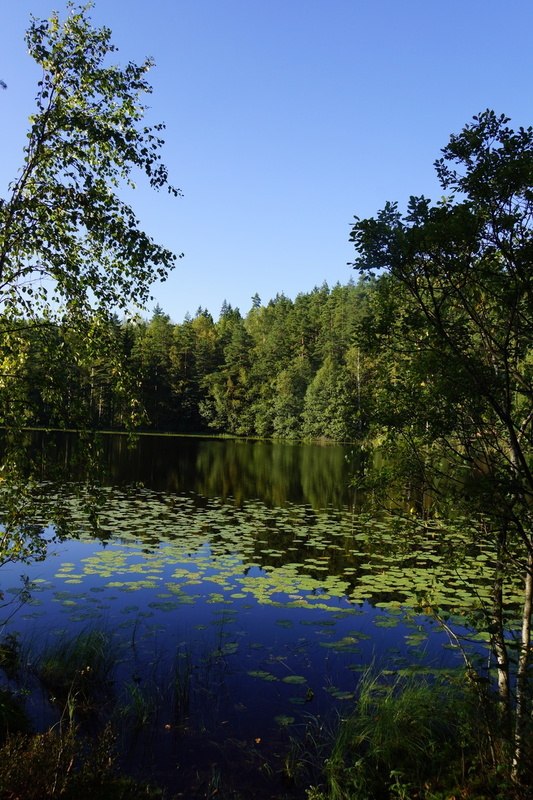 Like the other Scandanavian countries, Finland has laws that permit free passage (and mushroom hunting), even through private land. They also have a very short summer and thus a compact mushroom season, with lots of varieties growing all at once. 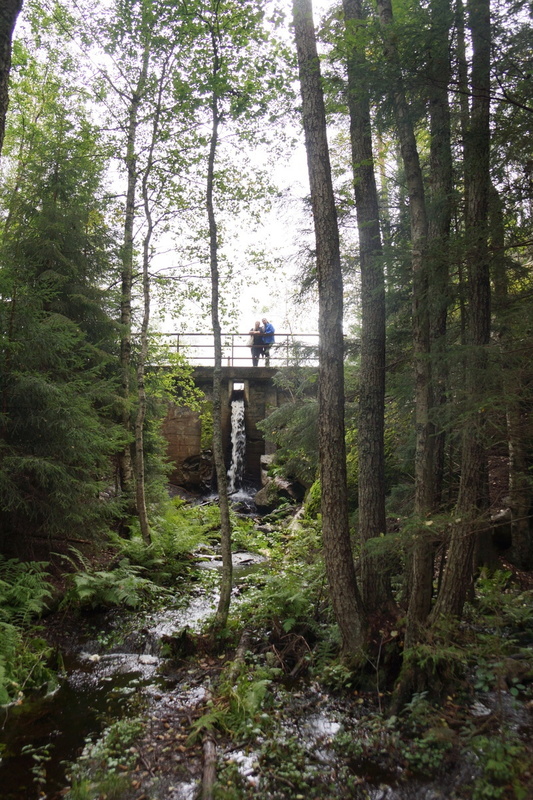 They also have great information on their national forests and camping, online and in English. 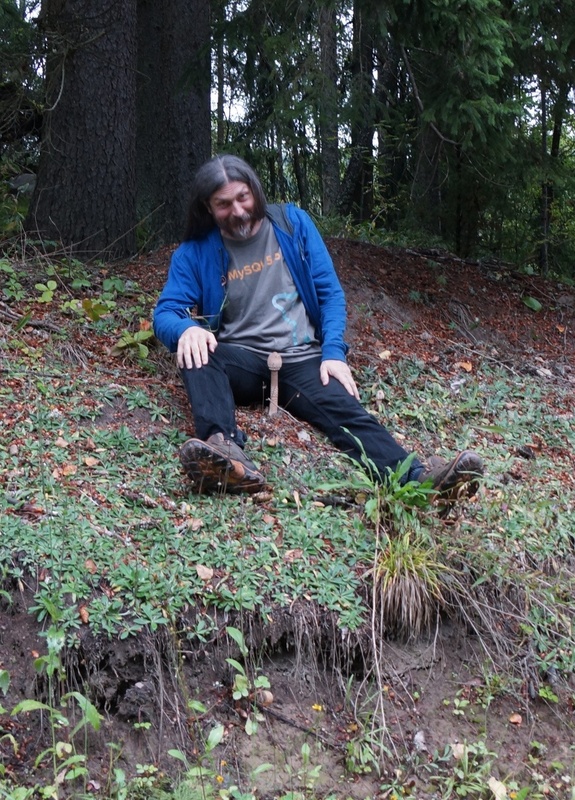 Eric was quite happy to find this proud specimen - probably a Macrolepiota. Toad and toadstool. 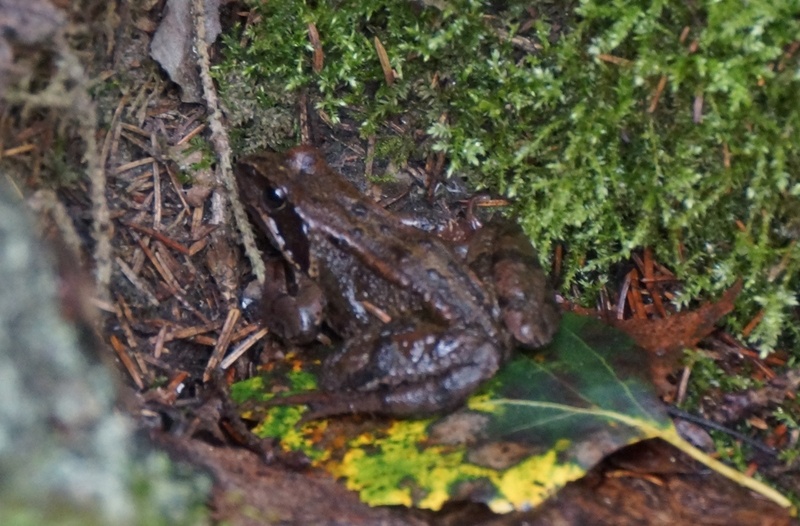 There were quite a lot of frogs in this forest as well, which I always interpret as a good sign. This frog (entirely different from the last frog - you see that right?) 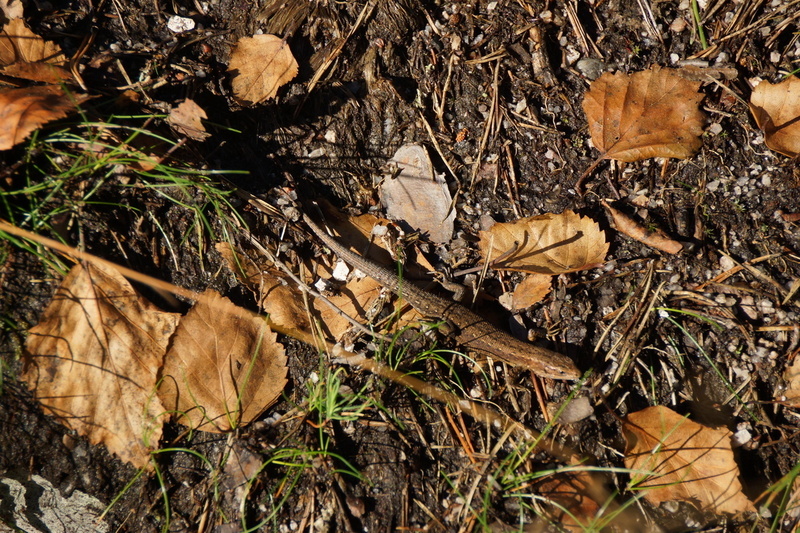 was doing his level best to imitate a dead leaf. 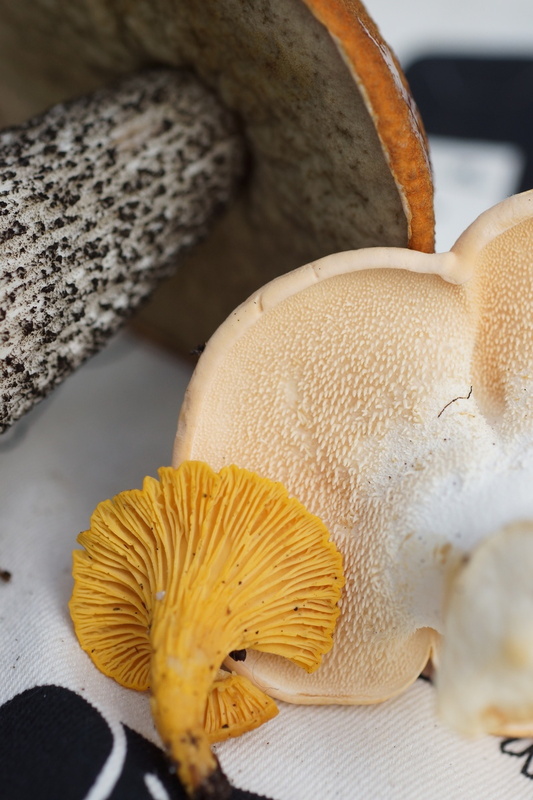 Three non-gilled edible mushrooms: Cantharellus (probably cibarius, but possibly one of the other yellow chanterelles), Hydnum repandum, and Leccinum (possibly auranticum, but there are several similar species that associate with different trees). The locals seemed to literally toss away the Hydnum, which was fine by me - I think they are even better than the chanterelles. 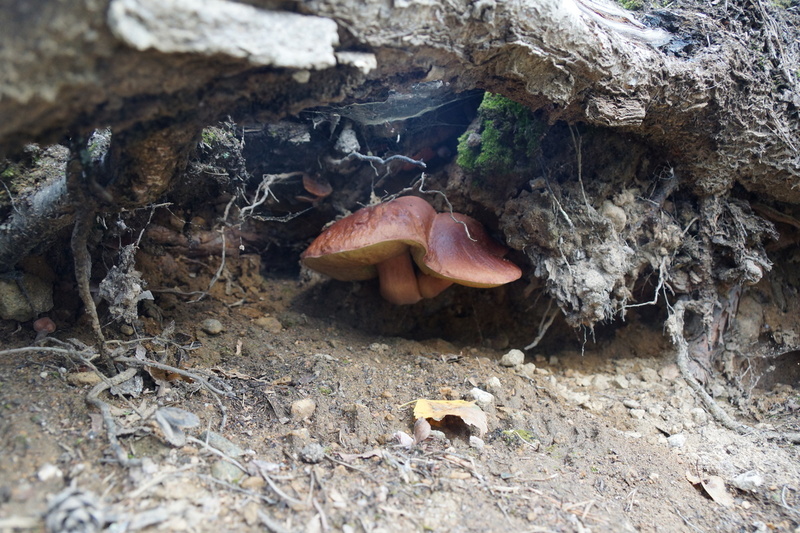 A pair of red-capped boletes. These two were growing under rocks overhanging the bank of the lake. You couldn't see them unless you were at the water's edge and looking back. I tend to distrust boletes with any hint of red, since the only poisonous boletes are red-pored, but there are actually quite a few reportedly edible red-pored types in Europe. I have not yet been confident enough of my ID to try one, though. 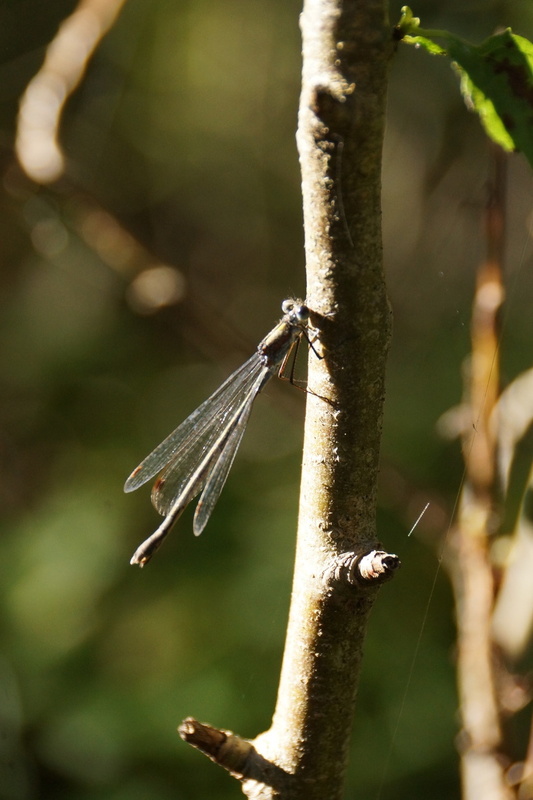 This one might, or might not, be Xerocomus rubellus. 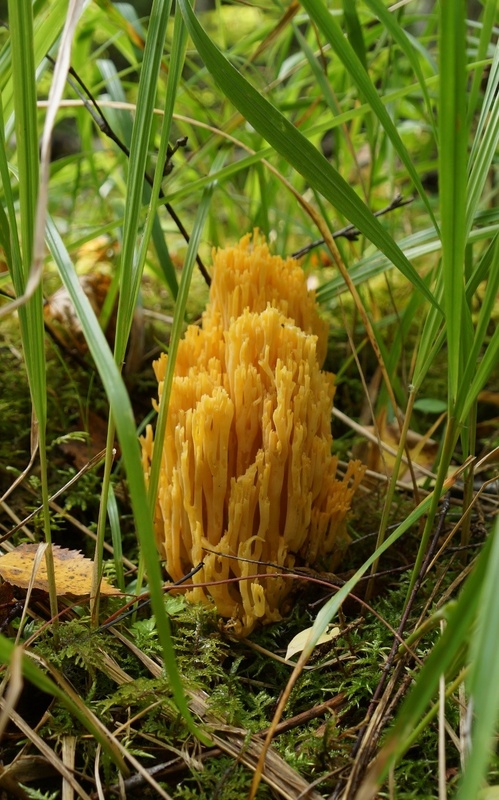 A coral fungus, probably a Ramaria species. There were dozens of these clusters, each about the size of my fist. 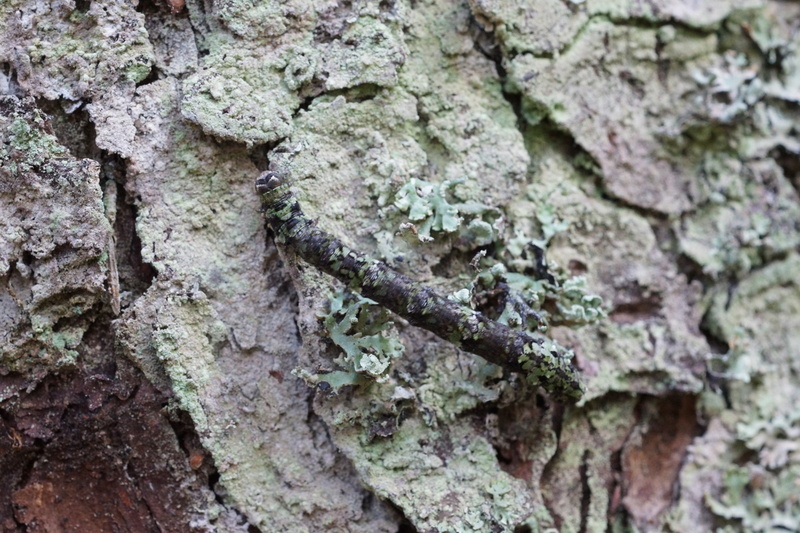 At first this looks like a lichen-covered stick in the moss. Then you might notice that it's an inchworm. Then you might notice that it's being attacked by ants. I can only assume that the inchworm had the misfortune to inch through an ant colony's territory. I felt sorry for it, picked off the ants, and released it on a tree that looked like the kind of place it's supposed to go. I have no idea if the ants injured it severely enough to kill it, but if it survives long enough to pupate, the process will heal any injuries. 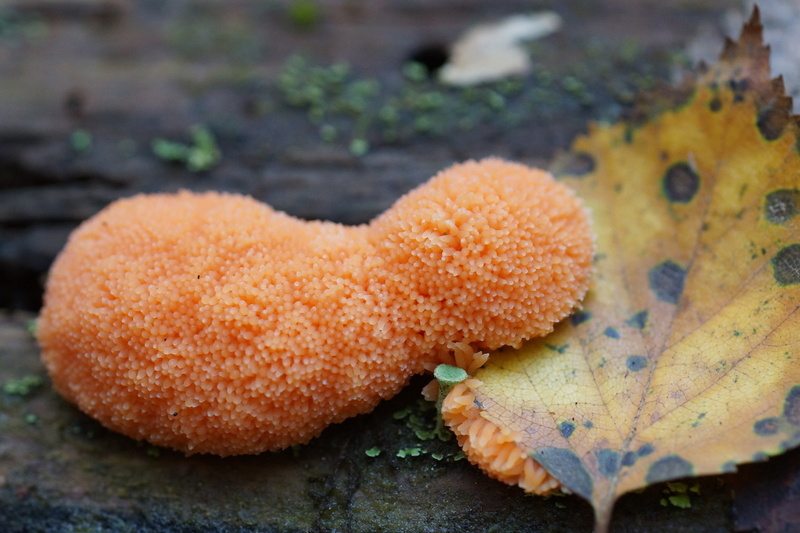 A bright orange slime mold, with a lichen. 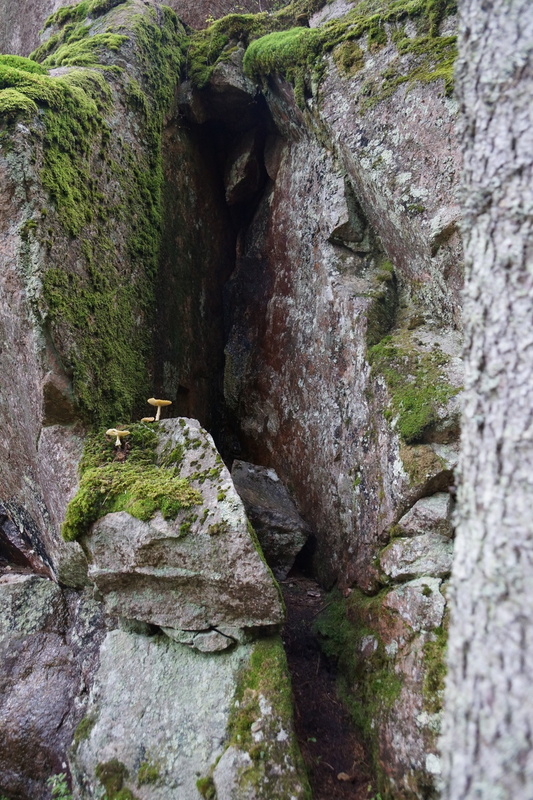 Mushrooms were growing in some very unlikely places. 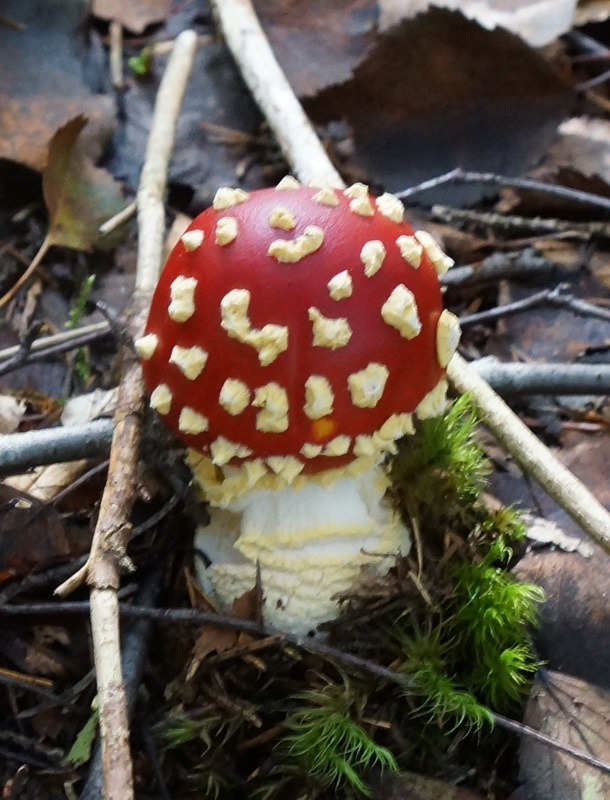 The thing that's weird about these is that they are Amanitas, and therefore mycorrhizal... meaning that there must be some tree roots under the moss somewhere. 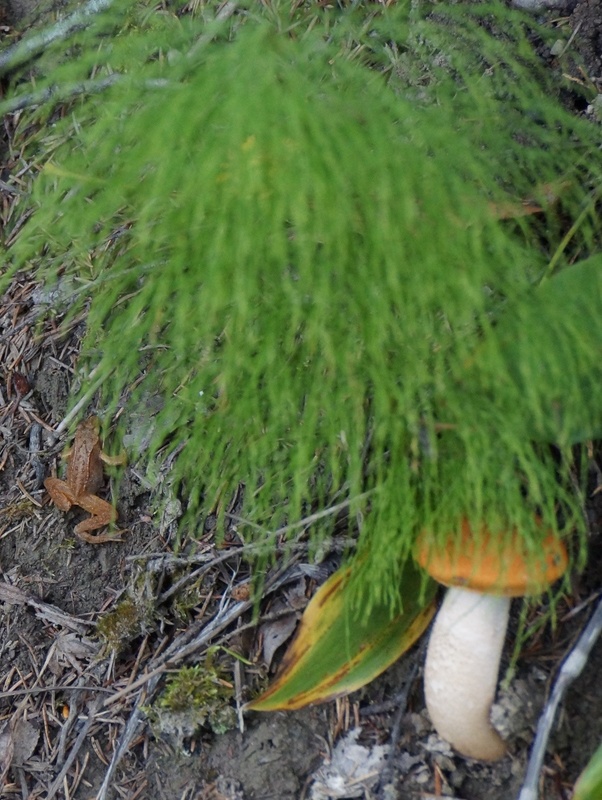 A couple of Cortinarius and some unidentified white mushrooms. 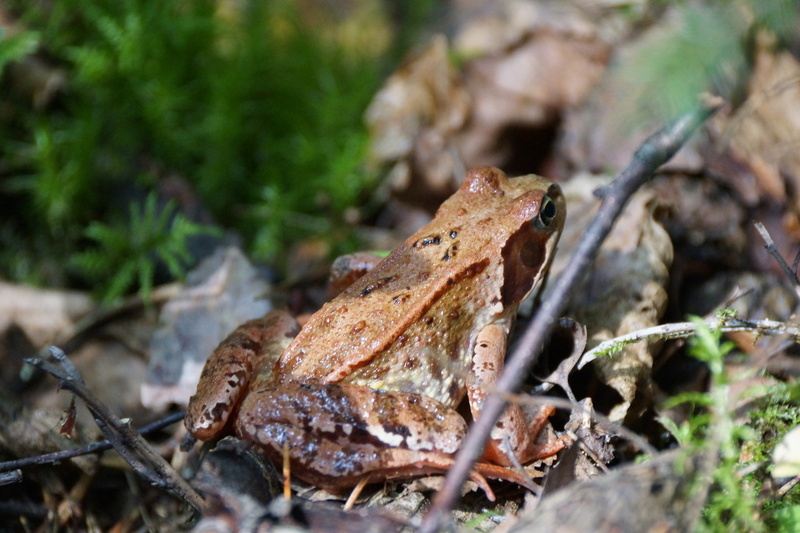 Another frog, doing a somewhat less apt job of hiding. 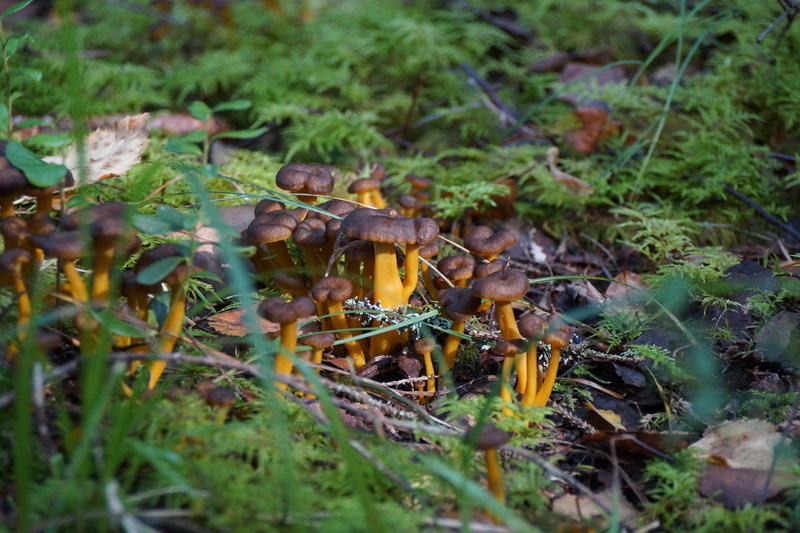 A troupe of yellowfoot chanterelles (Craterellus tubaeformis). 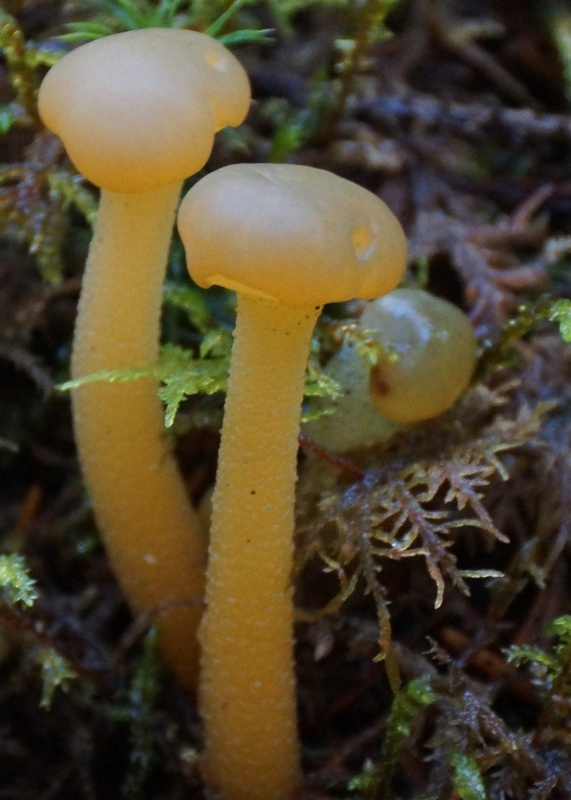 I'd tried yellowfoots once before and was not impressed, but these had a pleasantly fungal flavor - nothing like the fruitiness of chanterelles, but certainly good in their own right. 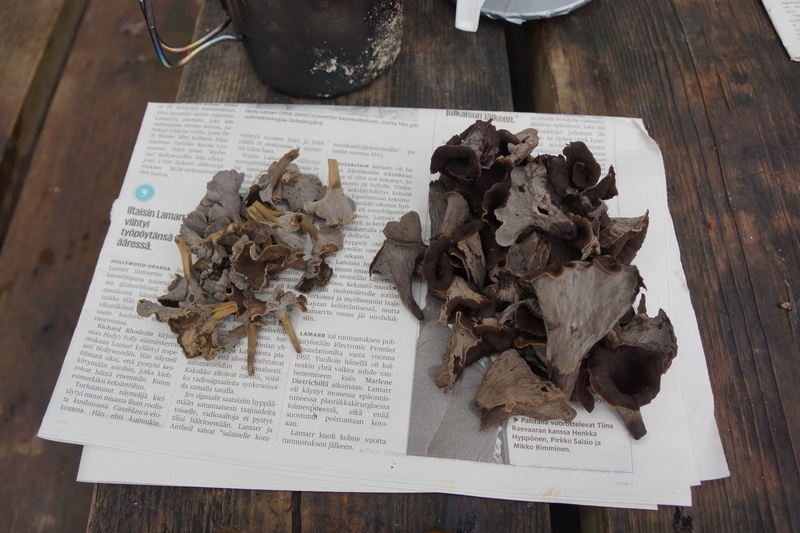 Black chanterelles (Craterellus sp. 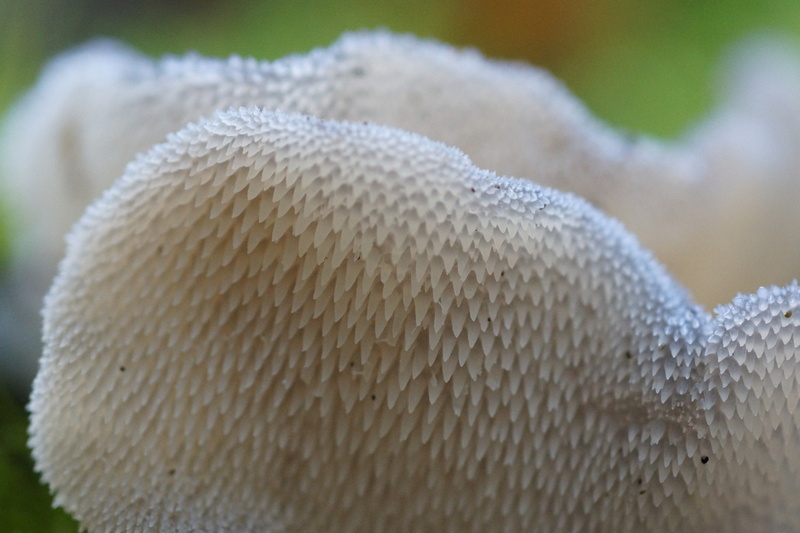 are one of my favorite mushrooms. First, they are tasty. But I think my favorite thing is that they look for all the world like holes in the ground. You can practically be standing on them and not see them. And when you do see them, there are nearly always in vast hordes, waiting to jump out to your eye like a static image. There were definitely two types in this forest, and there are a half-dozen different species of black chanterelle, so I'm not sure which ones I found. 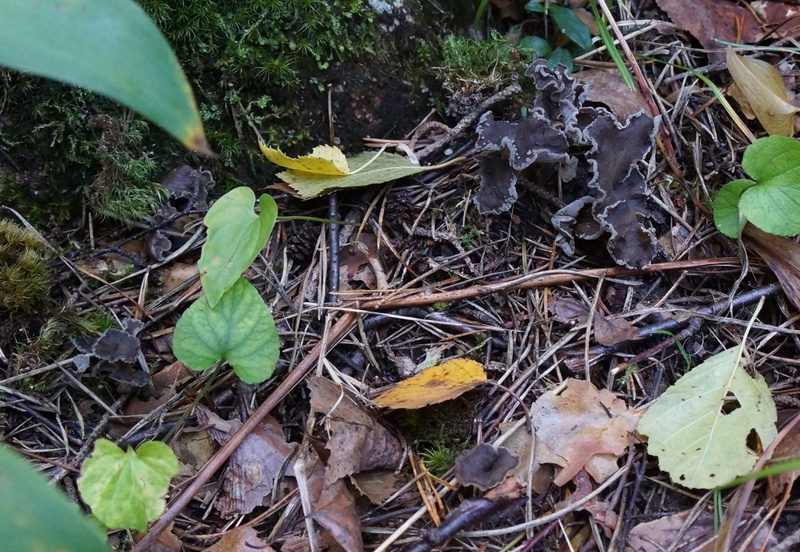 Probably the one on the right is Craterellus cornucopioides , and the one on the left might (or might not) be Craterellus undulatus. 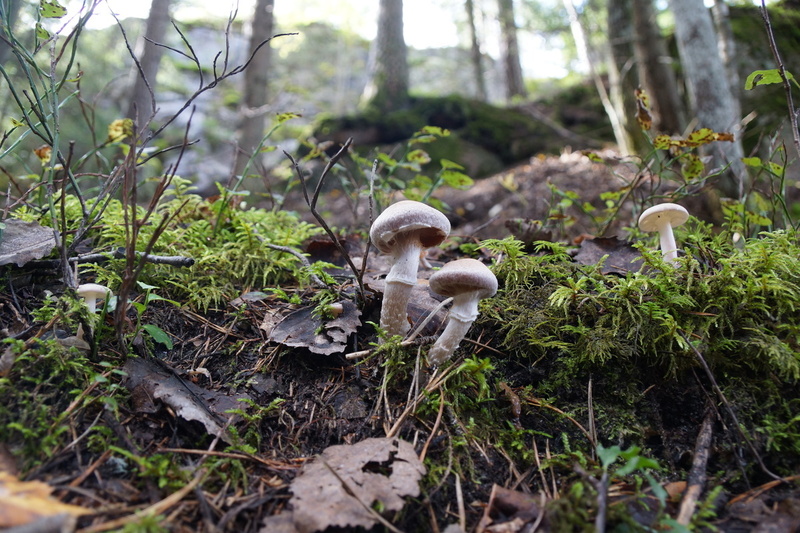 There were also quite a few Boletus edulis, also at the top of my list of favorite edible mushrooms. 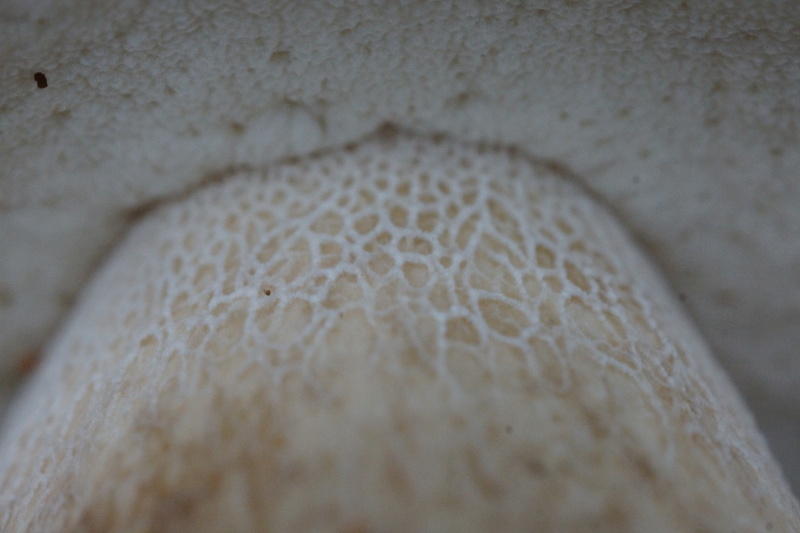 One of the distinguishing features of B. edulis is the fine network of ridges on the stalk, especially just under the cap. This mushroom, somehow reminescent of Sylvester McCoy's Radgast the Brown in Lord of the Rings, is probably a Cortinarius species. The orange ring is probably colored by rusty-orange spores. 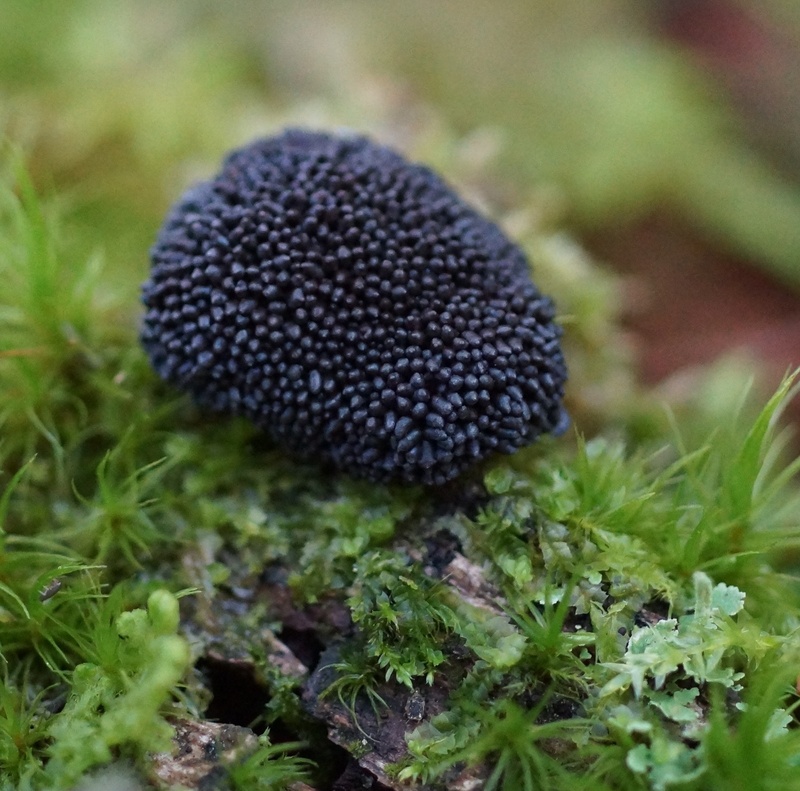 It's also a good guess by sheer numbers - Cortinarius might well be the largest genus of fungi. 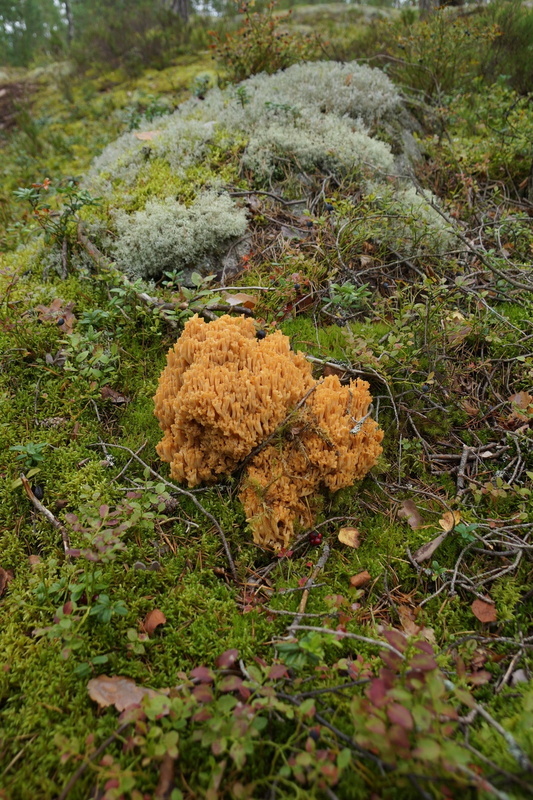 More orange corals - probably Ramaria sp., with macrolichens in the background. 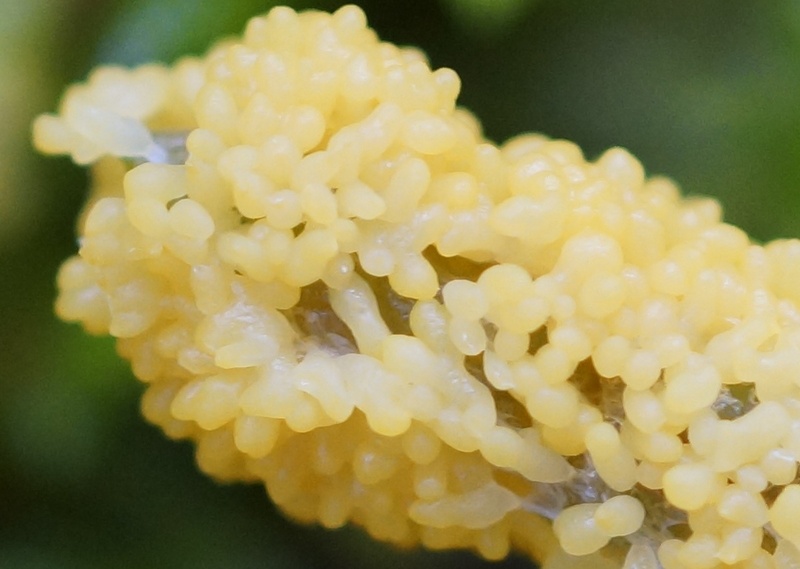 A close up of the yellow slime mold. 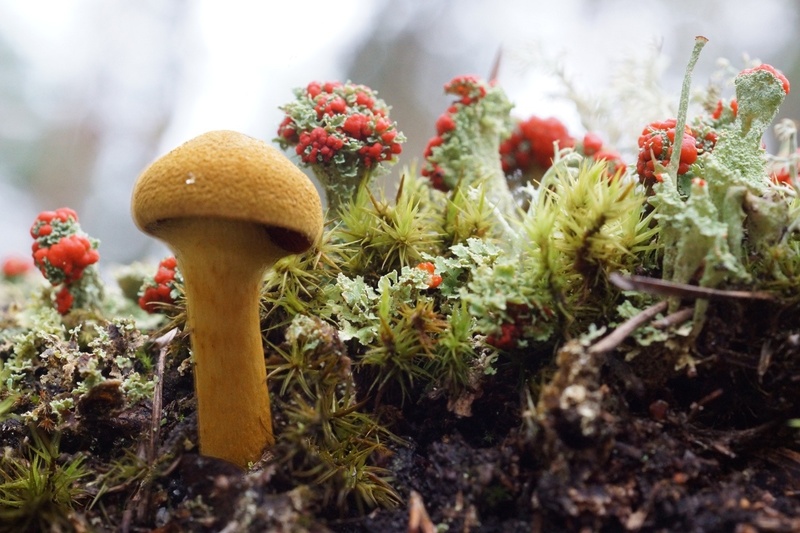 A tiny orange Cortinarius in the company of moss and lichens. A picture for those of you who complain that I never have photos of people. 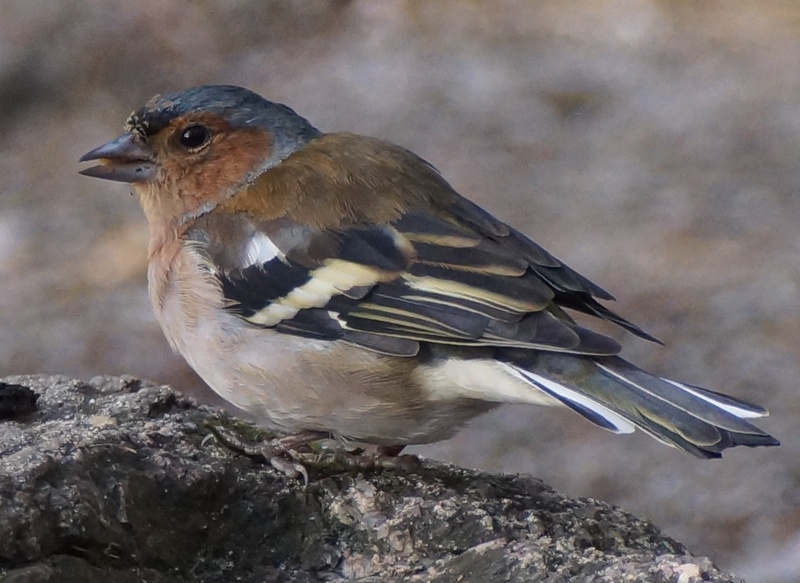 This little bird would come around whenever someone was cooking over the campfire. Eventually we saw it eating a bit of sausage dropped by one of the other campers - presumably it had learned to find the local source of suet. 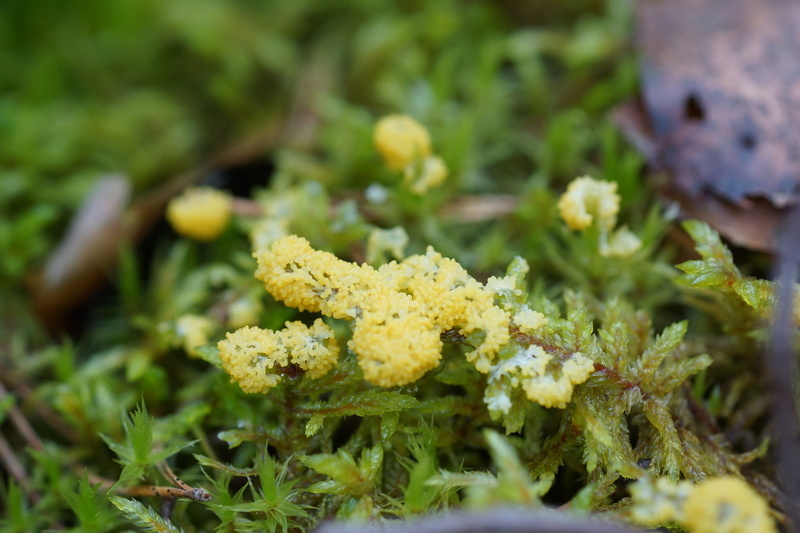 A stalked jelly fungus, most likely Leotia lubrica. 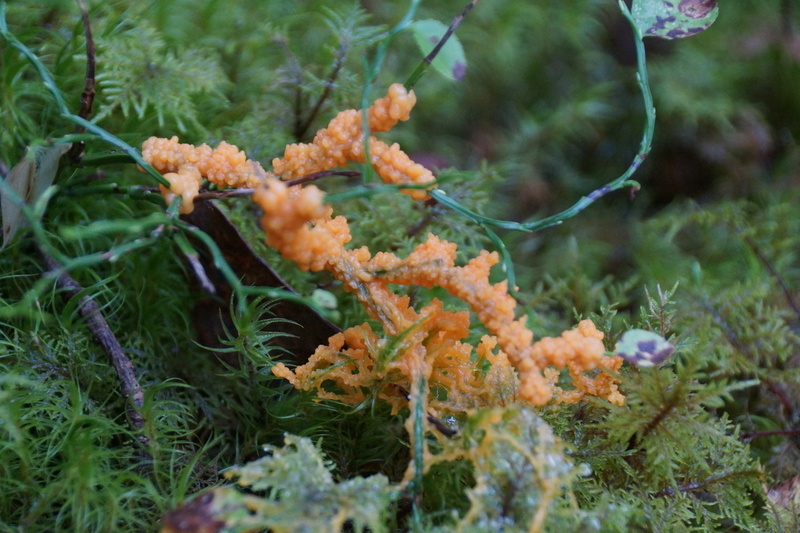 An orange slime mold creeping across the moss. Looking up for a moment - the view of the lake from the park's island. 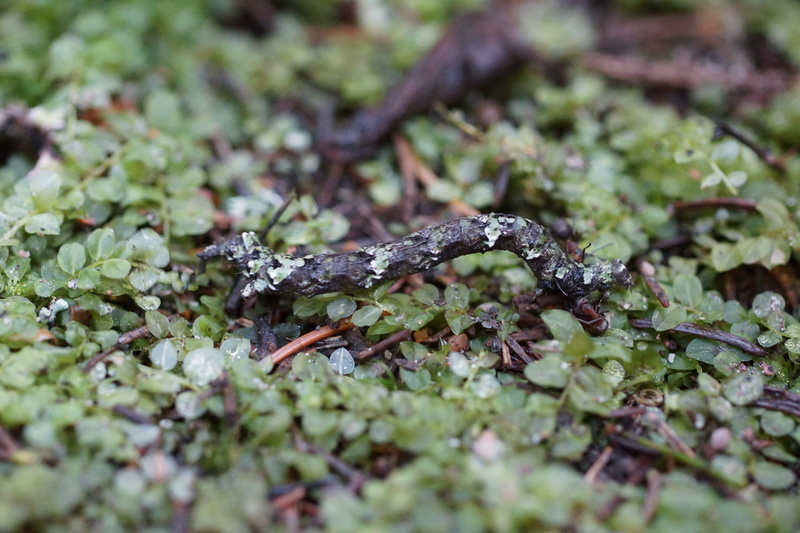 One of the things I like about mushroom hunting is that it brings your attention to many tiny, beautiful things. 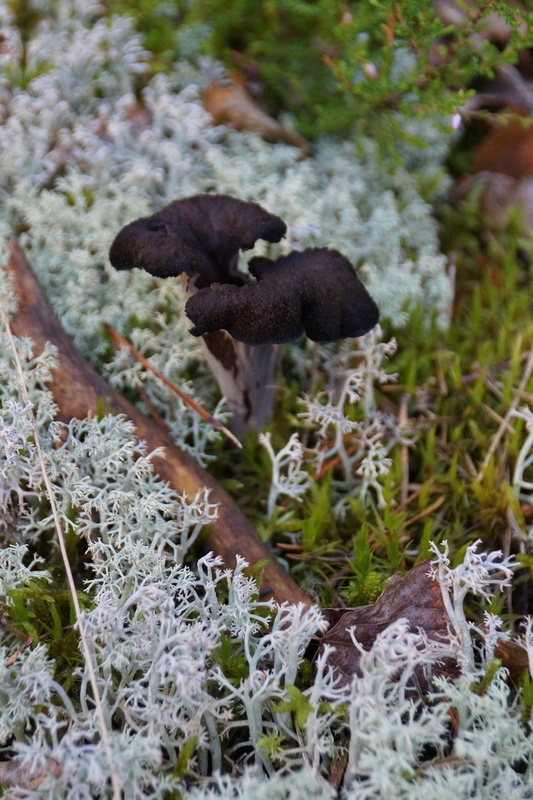 Black chanterelles among the moss and lichen. 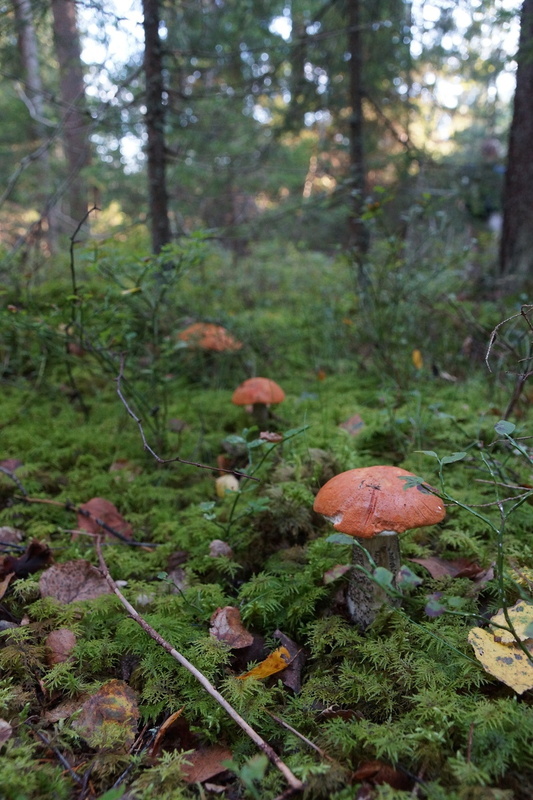 A row of large Leccinum, seeming to point the way to some fairy path.